Section 87A Tax Rebate FY 2019-20 | How to check Rebate Eligibility? You are here: Home / Tax Planning / Section 87A Tax Rebate FY 2019-20 | How to check if you are eligible for the Tax Rebate? As per the Finance Bill 2019, the threshold limit of tax rebate u/s 87A has been revised to Rs 12,500 for FY 2019-20. This tax rebate is applicable if an individual’s (Resident Individuals including Senior Citizens) taxable income is less than or equal to Rs 5 Lakhs (only). So, what is the meaning of Tax Rebate? Tax rebate is a refund on taxes when the liability on tax is less than the tax paid or liable to pay, by the individual is referred to as Income Tax Rebate. Income Tax Deductions are allowed to be claimed under each Head and also from Gross Total Income. The taxpayer can claim deductions in case he/she incurs specified expenditure or make specified investments under various sections of the IT Act. Examples: Investments u/s 80c (or) Health Insurance premium u/s 80D. Whereas, Income Tax Rebate is allowed to be claimed from the total tax payable. So, the exemptions and deductions are allowed to be claimed from the Income and Rebate is allowed from the tax payable. The Tax rebate of Rs 2,500 for individuals with income of up to Rs 3.5 Lakh had been proposed in Budget 2017-18 and the same has been continued for FY 2018-19 / AY 2019-20 as well. 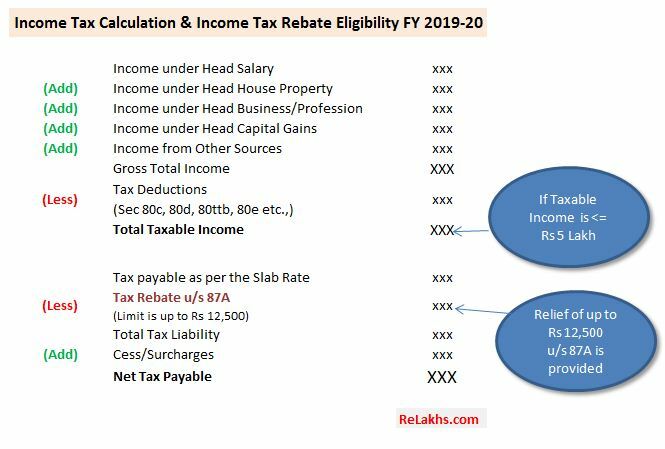 The rebate us/ 87A has now been revised to Rs 12,500 for FY 2019-20 / AY 2020-21. This means that if the total tax payable is lower than Rs 12,500, then that amount will be the rebate under section 87A. This rebate is applied to the total tax before adding the Education Cess (4%). 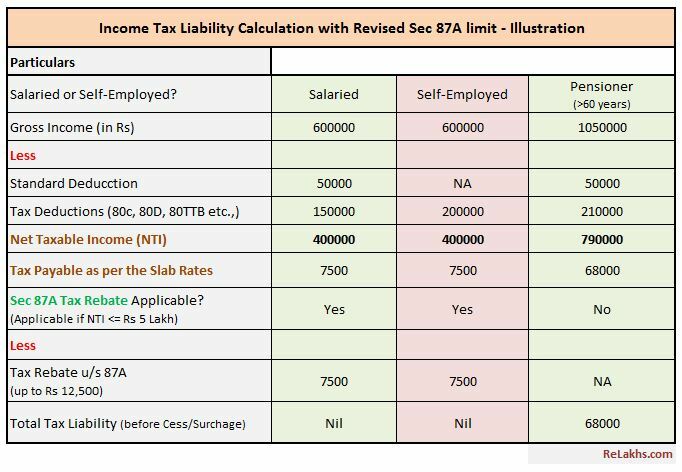 How to check if you are eligible to claim Section 87A Tax Rebate FY 2019-20 / AY 2020-21? How to check the eligibility of Income Tax Rebate u/s 87A for AY 2020-21? Can NRIs claim rebate under section 87A? – No, this tax rebate is only allowed for Resident Indians. Therefore, taxpayers qualifying as Non-Resident Indians are not eligible for a rebate under 87A. Can this rebate be claimed by a Firm or Company? – This rebate is only allowed to individuals. HUFs or firms or companies cannot claim this tax rebate. Are Cess & other charges (if any) need to be added before or after claiming this Tax Rebate? – Education Cess and SHEC are levied on the Tax payable after allowing for tax rebate of up to Rs 12,500. My Taxable income is less than Rs 5 Lakh, so my tax liability would be NIL. Do I still need to file my Income Tax Return for FY 2019-20 / AY 2020-21? – You can avail of the zero tax benefit announced in Budget 2019 but you still need to file your income tax return (ITR). The income tax exemption limit for all citizens below 60 years still remains at Rs 2.5 lakh and for senior citizens Rs 3 lakh. Therefore, if you are earning anything above these basic exemption limits annually then you are mandatorily required to file your ITR. List of Important Tax Deductions for FY 2019-20. Snapshot of 22 most Popular Investment options in India! How Income Tax Dept tracks the High Value Financial Transactions? Kindly note that the above information is based on the proposals presented in the Interim Budget 2019-20. The above details will be updated (if required) after the presentation of the Full Budget (if any) by the next Govt. Hey Sreekanth, I do not see u have provided correct calculation here. For the 1st picture, a salaried employee having gross income of 600000, after deduction NTI is 400000. Then if you consider flat deduction of 250000 (bcoz tax is 0 between 0-250000 bracket), then taxable income becomes (400000-250000) = 150000. And tax becomes (150000*5)/100 = 7500. And this 7500 comes under 87A. Whereas u are showing the tax amount as 12500, which is wrong. Please do not put incorrect data if you are not sure. This makes people confused who are reading the article. Thank you for highlighting the mistake, I stand corrected, updated the image. Keep visiting ReLakhs! My question is to claim Tax Rebate benefit. What are components i can consider to get my net taxable Income amount. Yes, you can consider the said components. HRA exemption is subject to certain conditions. RELAKH IS NOT ANY CERTIFIED CHARTED ACCOUNTANT/ ICWA/ CO.SECRETRAY. HE IS JUST ADVERTISING THE TO THE PUBLIC. Yes, we are not CAs/CWAs. But, unable to understand your second point?? second point is just to advertise public issue of shares/debentures & fixed dedosit of the companies where in handsome commission paid to brokers such as you, Inocent investor traps into your advertisement of company & invest their hard earned money in old age. We do agree that we are not an expert in taxation matters. However, we do not accept your allegation that we are an intermediary/broker. Do note that we are not associated with any financial product or service provider. We do not have anything to SELL here through this platform! sir I am senior citizen and i am earning through contractual service other than pension. Shall I entitled to avail standard deduction and contractual earning where to show in return form. If your earnings are considered as ‘Salary’ then you can claim Standard deduction. I am 30 years age, NRI , Married. I heard that ICICI launched a new NFO called ICICI Prudential Retirement Funds (Equity and Debt Plans) – As of now, I havent started any investment for my retirement which is almost 20 years far itself..What do u think about this ICICI NFO(Equity plan)? Should I choose this? Please share ur thoughts..
Also Do u have any article regarding NFO investment? As these are New Fund offers, we do not have the track record to measure the performance. We have plenty of decent existing choices with long track records. You may ignore NFOs. * Best Mutual Fund Schemes to invest now! * List of all Popular Investment Options in India – Snapshot! Thanks for reply..May i know if it possible to automatic debiting the SIP installment form my bank account to various AMC s at different date? then How? Is this facility available in MF utility n RTAs? Yes, it is possible for Auto-Debit. You need to submit ECS mandate. You can do it through MF Utility or any online MF platforms ..
Kindly note that the tax slabs have been kept unchanged in the interim budget 2019-20. As mentioned in the above article, Income Tax Rebate is allowed to be claimed from the total tax payable. So, the exemptions and deductions are allowed to be claimed from all types of Income (including Capital Gains) and Rebate is allowed from the tax payable. Hence, I believe that one can claim the tax benefit of Rebate u/s 87A. IN YOUR CHART YOUR GOOD SELF CALCULATED TDS FOR ABOVE 60 YEARS (PENSIONER) RS.68000/- MY QUESTION IS THAT INCOME TAX EXEMPTION RS.500000/- ABOVE 80 YEAR i.e.VERY SR.CITIZEN. YOUR GOOD SELF STATED > 60 YEARS. IS IT RIGHT OR WRONG ON YOUR PART.CHART SHOWING SALARIED,PROFESSIONAL& > 60 YEARS SHOWN ABOVE. In the illustration, it has been assumed that the Tax assessee is a Senior citizen and not Very Senior Citizen. (Let me add the assumption in the article). Thank you! Its Form 19 for EPF withdrawal. You may submit your grievance to the EPFO via this link to speed up the processing..